The Sound Leisure Rocket jukebox is a brand new design evoking the classic "Silver Age"! In 1951 the song "Rocket 88" was released - a hymn to the joys of the classic Oldsmobile, it was proclaimed the first true Rock n' Roll record! 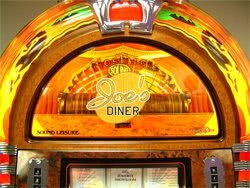 This brand new jukebox has been named after the song as it truly captures the feel of the Silver Age of the 50's. Under "the hood" of the Sound Leisure Rocket CD Jukebox you will find an 80 CD mechanism, 300 watt stereo amp and 5-way speakers - add remote control and coin operation and this is a Jukebox that is revved and ready to go. 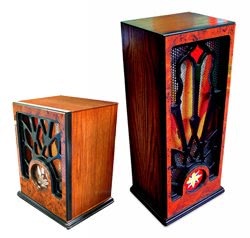 You can only marvel at the style, detailing and vintage looks of the Sound Leisure Rocket! One Man Delivery Service – Delivered to a ground level room of your choice. This product is delivered by Sound Leisure who will contact you by telephone to confirm the delivery day and a time. Delivery is around 14 weeks depending on your location. We will deliver your jukebox to a ground level room of your choice; however, we do ask that you check your goods will fit in your property and that any entranceways, hallways, corridors etc are free from obstruction. Due to their size and weight jukeboxes require a completely level surface for access into your property. We ask that the customer relays any details of possible access restrictions, including small steps, gravel driveways, grass or front of property steps to Liberty Games at the point of sale. Please note that this delivery includes setting up and switching on your jukebox. Free delivery is to UK mainland only. For areas north of Glasgow, Cornwall, Devon and overseas please contact Liberty Games for a shipping quote before placing your order.